Yoga and Ayurveda have gained increasing importance in the last couple of years. Although these practices and disciplines originated in India, they have gained a lot of popularity outside the country, specifically due to the amazing benefits they offer. Specialists from these disciplines have always believed that the approach to health should not only be physical but also mental, emotional, and spiritual. Their methods of practice also support this approach. And the same holistic approach comes into play in their diets as well. Yoga and Ayurveda emphasize on the Satvik diet for healthy eating. The Satvik diet is found to be abundant in Prana, a universal force that gives life to the plant and animal kingdoms. A Satvik diet is based on foods which are high in ‘sattva guna' (goodness), according to Yoga and Ayurvedic sciences. These systems believe that the diet leads to a clear mind and calm demeanor, while simultaneously benefiting the body. 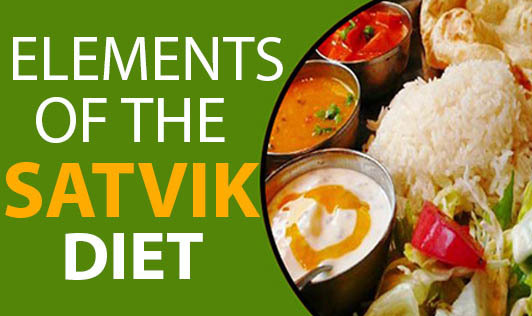 Experts say that a Satvik diet has all the 5 natural elements and this helps maintain overall balance. A Satvik diet includes water, fruits (all varieties), most of the vegetables, cereals, breads, pulses, nuts, oilseeds, dairy foods, and honey. Cow's milk is considered the most Satvik of all foods in this category. Goat's milk is treated as a good substitute for cow's milk but buffalo milk doesn't come under the Satvik food group. The Satvik diet does not include onions, garlic, red chilies, black pepper, and other pungent spices because they are believed to be stimulants. On the contrary, spices like turmeric, coriander, cardamom, cinnamon, and aniseed are recommended because these spices help the digestive system. Satvik foods are simple and easy to digest. They also require minimal cooking. Since there's not much processing before these foods come to the dining table, they are closer to nature than other foods. Ideally, Satvik foods are to be eaten fresh and immediately after cooking. Barring fruits, not many raw foods come under the Satvik diet because raw foods are considered to be carriers of infectious agents. Experts believe that a person who eats Satvik food can achieve a great combination of physical, mental, and emotional harmony. It goes without saying that such a person would be well focused in life and work as well. Additionally, the Satvik diet improves immunity that allows its follower to remain disease-free or even if he/she falls ill, the recovery would be quick.